Toyota, the hybrid car leader, is challenging General Motors, the plug-in hybrid car leader. I have driven both the Chevrolet Volt and the Prius Plug-in through a similar mix of freeway, city stop-go, steep ascents and descents, and windy roads along the ocean. Both cars have been a pleasure to drive, whether silently gliding in EV mode, accelerating on to a highway, or navigating turns in the road. But one car gives most drivers more value for the money. Both cars are stylish hatchbacks with 40/60-split back seats that can drop so that you can haul lots of stuff. The Prius Plug-in Hybrid vehicle (PHV) is a roomier and seats 5. The Volt seats 4. Both cars can fit someone who is at least 6-foot 4-inches in either front or back seats. Both save at the pump by letting you charge with either standard 110v outlets, or by installing a 220v Level 2 charger. The Prius Plug-in only has a 15-mile electric range in comparison to the Chevrolet Volt’s 35-mile electric range. 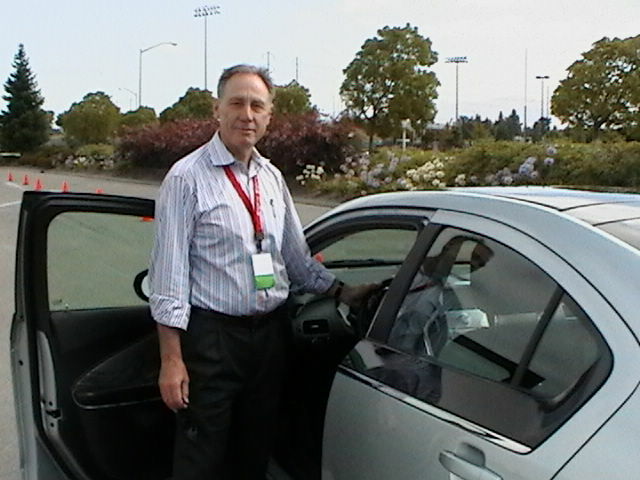 Prius PHV drivers are mostly fuel with gasoline. Chevrolet Volt drivers are mostly fueling with electricity. All-electric cars like the Nissan LEAF only fuel with electricity. Many owners of Prius PHV and Chevy Volts do not bother to install a Level 2 charger in their garage. Both cars can fully charge at night, adding about 4 miles of electric range for each hour of trickle charge. Both can easily use the thousands of public chargers installed across the USA. Like hybrids, each of these cars uses both electric motors and an internal combustion engine. Unlike hybrids, these cars can use garage or public chargers to put energy into their lithium battery packs. The automotive engineers took different approaches to the two drive systems. The Prius Plug-in Hybrid uses an internal computer chip to decide when to engage the motor, the engine, or both. With enough charge, the driver can touch the EV button and only use the electric motor. GM calls the Volt an extended range electric vehicle. The electric motor is always used to propel the vehicle; the engine is normally used in a series configuration to act as a generator. GM now admits that at times the motor and engine work together. I have always referred to the Volt as a plug-in hybrid. Because they are plug-in hybrids, with a full tank of gas, range is over 400 miles. No need for range anxiety, just fill-up the tank and go. The Prius PHV starts at $32,000; the Volt at $39,145. Add delivery and handling to both. By a Prius PHV and get $2,500 back on your next Federal Tax return; buy the Volt and get $7,500 back. At first glance, the Prius Plug-in cost about $7,500 less than the Chevrolet Volt, a plug-in hybrid with a 35-mile electric range in comparison to the Prius PHV’s 15-mile. After federal tax credits, the difference narrows to less than $2,500. After 2 to 4 years, the cost difference disappears with the Chevy’s extended EV range saving that $2,500 at the pump. This new 2012 Toyota Prius Plug-in (PHV) looks just like the classic Prius Liftback except for the electric charge port covered above the left rear wheel. When I touch Start the useful LED displays light and I’m ready to drive. The car’s default driving mode is ECO for fuel economy. At any time while driving, three buttons on the dash allow convenient driving mode selection – EV, ECO, and Power. I touch EV, step lightly on the accelerator and glide away. In EV mode, the Prius PHV is only propelled by one of two electric motors. One motor is for propulsion, the other for electricity generation. This Prius PHV is quieter than a Liftback, but unlike the Nissan LEAF, I hear the gasoline engine, which can sometimes idle even in EV mode. When not driving in EV mode, the Prius PHV delivers about the same fuel economy as the Prius Liftback. The Prius PHV averages 49 mpg in ECO hybrid mode and is rated at 87 mpg overall. The Prius PHV drive system is based on the proven Toyota Hybrid Synergy Drive well in its hybrids for over a dozen years. The full series-parallel hybrid drive system uses imbedded computer chips to automatically engage, as needed the 80-horse power (60 kW) electric motor and/or the 1.8L 98-horsepower (73 kW) gasoline engine. The Chevrolet Volt only needs a 1.4L engine to act as a generator. Managing the engagement of electric motors and engine is a Hybrid Transaxle, which combines power split planetary gear set ring with speed reduction planetary gear set ring. The car gets great mileage because energy is captured, whenever possible, from braking and energy resistance. On a long downhill, you can shift into “B” for added regen. I asked my friend to join me for a test drive. John had a Prius for seven years before giving it to his daughter when he bought his Chevrolet Volt. I had a Prius for seven years before giving it to charity when we bought our Nissan LEAF. Both John and I were Prius enthusiasts and now we are electric car enthusiasts. 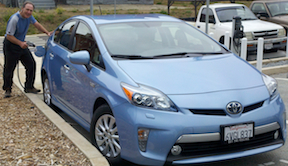 For the test drive, Toyota loaned me a Prius PHV Advanced with a price of $39,525. For some $7,000 more than the base Prius PHV it included a Premium HDD Navigation with Entune, plug-in hybrid apps, LED headlamps with auto level control, Safety Connect, dynamic radar cruise control, head up display (HUD), and pre-collision system. A Chevrolet Volt with similar options would not cost any more than the Prius PHV after the Federal Tax credit. After driving 11.8 miles in EV mode, the Prius PHV battery seamlessly engaged the 1.8L engine with the lithium battery too depleted to continue in EV mode. We continued the drive in ECO mode with the Prius PHV delivering the kind of good mileage you would expect from a Prius. It was easy to pass other cars on a freeway ascent. On a steep decent, I shifted to “B” capturing extra regen energy by using the motor as a generator. The Volt also has “B” for extra regen. My LEAF does not. The Prius PHV handled well on the turns over the ocean cliffs. We stopped for lunch at a Taco Bell perfectly located on the Pacific Ocean. After lunch, I put the Prius in POWER mode for fast acceleration on to Coast Highway. Like the Volt, the Prius has fast acceleration using the electric motor. We both liked the Prius Plug-in. The trunk area has room for John’s golf clubs; with the Volt the 40-split back seat must be dropped to fit them. The Prius seats 5; the Volt 4. Some people have more confidence in the Toyota brand. But if you’re going to buy a plug-in, the Volt meets average American driver needs in electric-mode and the Prius does not. The Volt’s $2,500 after tax premium is likely to pay for itself in gasoline saved. We like both cars, but John’s keeping his Chevrolet Volt and I’m keeping my Nissan LEAF. Prius PHV will be the best if you want a plug-in hybrid from Toyota. Its starting price is $8,500 more than the best-selling Prius Liftback. The gap narrows to $6,000 after a federal tax credit. Your employer or state may give you added incentives to get the plug-in. The Prius PHV includes a touch-screen navigation system with backup camera and other features, which would be optional extras on the base Prius Liftback. If you get stuck in nasty rush-hour commutes an HOV sticker can have real value. Electric charging is cheap; gasoline fill-ups are expensive. The Prius PHV might pay for itself in a few years compared to the Liftback. Chevrolet Volt is tough competition for the Prius PHV. The Prius Plug-in cost about $7,500 less than the Chevrolet Volt, a plug-in hybrid with a 35-mile electric range in comparison to the Prius PHV’s 15-mile. After federal tax credits, the difference narrows to only $2,500. The Prius PHV seats five, the Volt only four. I have been impressed test-driving both. They are both worth your taking a test drive. Ford C-MAX Plug-in Hybrid. Later this year, Ford will start selling a five-door, five seat plug-in hybrid hatchback with more room inside than either the Volt or the Prius PHV. The Ford C-MAX Plug-in is expected to have a 30 mile electric range versus the Prius PHV’s 15. Ford has not yet announced pricing. Ford is also selling the Focus Electric with 100-mile pure electric range. Nissan LEAF is the best selling electric car. My experience as an owner is that this all-electric has an electric range of up to 140 miles on 30 mph streets, but only 60 miles when cruising the freeway while running your air conditioner. My wife and I share the LEAF and also have a hybrid which we use a couple of days weekly and on long-trips. By itself, the LEAF with its limited range would only meet 80 percent of our needs, but with two cars range has never been a problem in over one year. It cost us $40 monthly in electricity to run the LEAF, the cost of one fill-up at a gas station. Toyota will have no trouble selling the 15,000 Prius PHV planned for initial production. The 2012 Prius PHV will be an appealing alternative to many who first consider the less expensive Prius Liftback. With only a 15-mile electric range the PHV will not be for everyone. Toyota Motor Corporation is now offering customers a wide-range of choices including the Toyota RAV4 EV, the Scion IQ EV, a family of four Prii, the Camry hybrid, the Highlander 4WD hybrid, five Lexus hybrids, and a growing range of fuel economy offerings for most drivers.